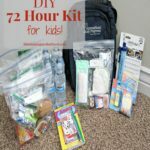 Do you have your 72 hour kits ready? I have spent weeks reading everything I can get my hands on to try to make the best 72 hour kits for our family. Hopefully we never have to use these, but I’m glad we have them all done now. I was joking with my husband the other night that if there is ever an emergency, we better grab those first since I spent so stinking much time researching them! 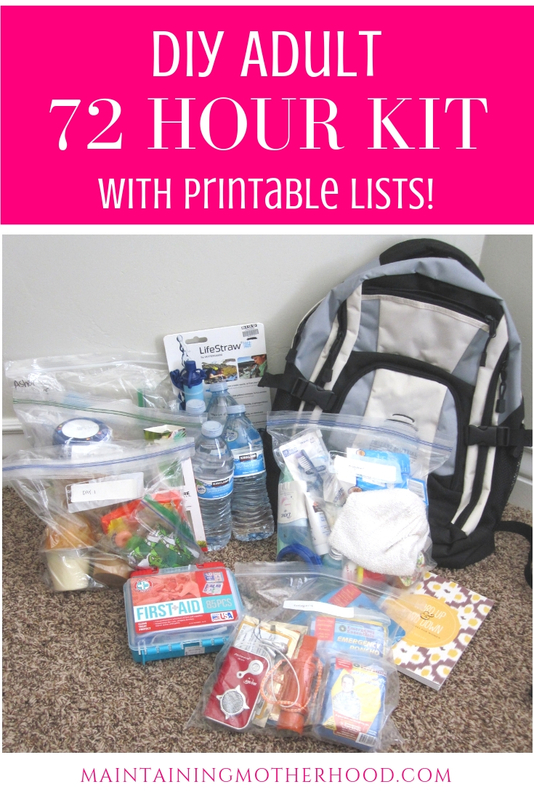 Now that I have done all the grunt work for you, this should be a super easy project where you simply print the list and put together your supplies! 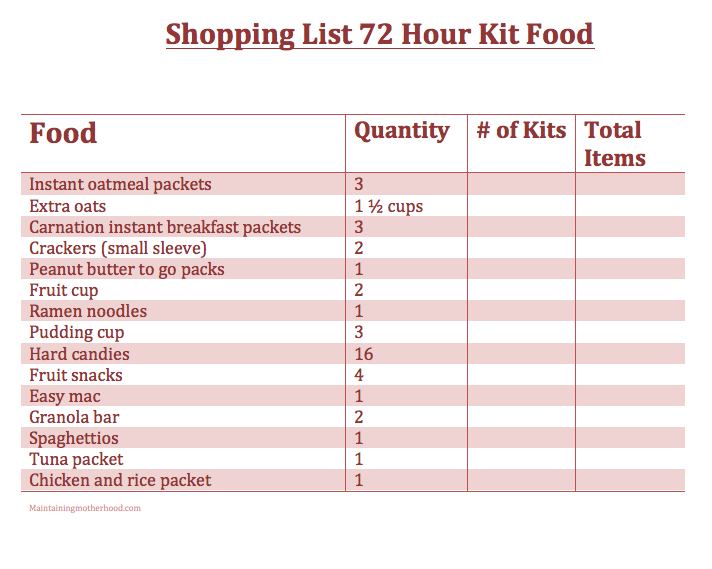 For our 72 hour kits, I wanted to have things in the backpacks that were practical, easy to use, and easy to access. We have 2 emergency totes in addition to the backpacks. One tote has extra emergency supplies and the other has extra food. 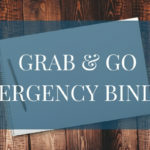 I am hoping that we would be able to grab all the extra totes in the event of an emergency. If we have to leave on foot we have the necessities in our bags, but they aren’t so heavy that we can’t manage them. Knowing that some kids won’t be able to carry their own packs, and some kids would most likely have to be carried made this extra important. 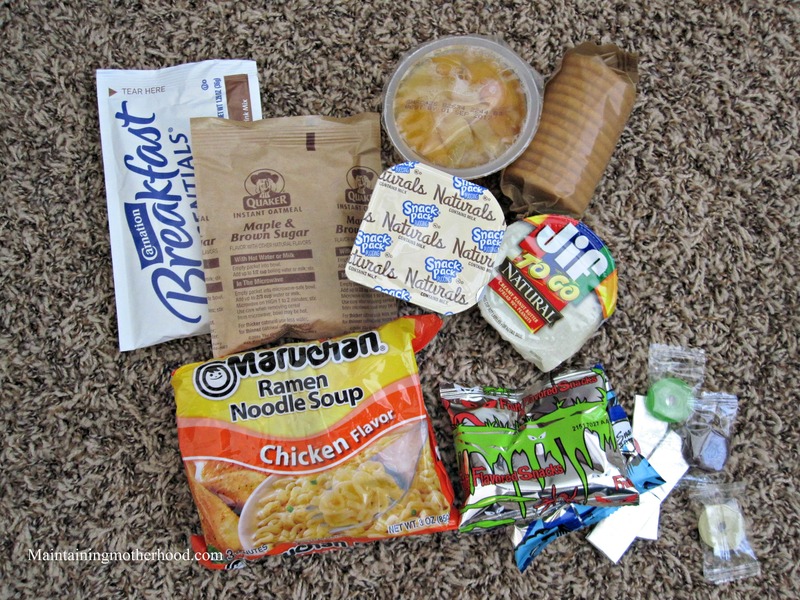 Within the backpacks, each category of supplies is separated by a Gallon Ziploc bag. This will make it easy to find things when we do have to use our kits, and also will make rotating things MUCH easier. 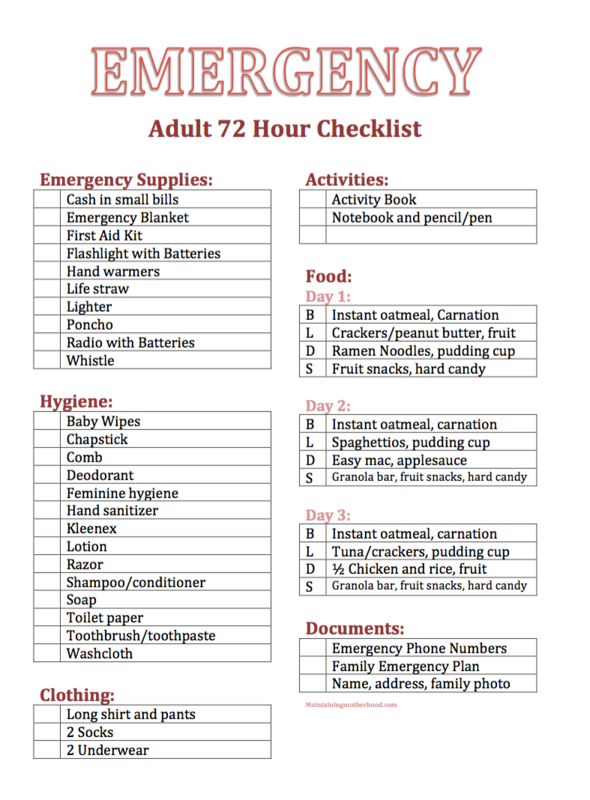 Get your Adult 72 Hour Kit Checklist here! I have an amazing Aunt who has given us TONS of emergency supplies over the years. Every Christmas, I look forward to seeing what new things we will receive. One year we got a portable toilet! With little kids, I can’t even tell you how awesome that will be to have an actual toilet seat to use! Baby wipes, Chapstick, comb, deodorant, feminine hygiene, hand sanitizer, Kleenex, lotion, razor, shampoo/conditioner, soap, toilet paper, toothbrush/toothpaste, and washcloth. 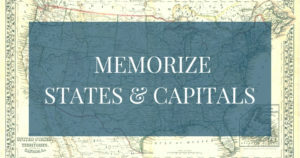 I have a whole other post on just the food aspect of things where I break different food options up by easy to hard in preparation for your kits! 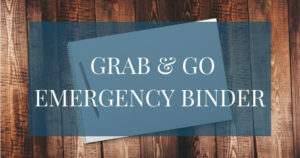 Each 72 hour kit also has a Grab and Go Binder with printouts of Emergency phone numbers, our Family Emergency Plan, a card with our family info, and an up-to-date family photos and all the other important documents we would need. Great job! But what are you planning to do with the instant breakfast? They need to be added to milk. You might want to add some instant milk packages. Also, I am seeing things that require cooking and I’m not seeing any means to do that, a pot or pan to cook in, or dishes and silverware. Several of your items also require extra water. I don’t mean to be negative. 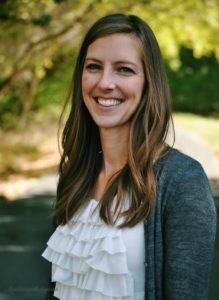 It is great that you are preparing your family. Totally not seeing this as negative, thanks for clarifying! Earlier in the post I did state that we have additional totes and emergency water. If we had to leave but were able to take our car, those totes are packed with additional foods and cooking items and are easy to access. Everything in the backpacks can be cooked with just adding water (there is additional water in adult backpacks compared to kid backpacks) although it wouldn’t taste quite as delicious as it would if it were cooked, for sure! I tried to make things as simple as possible in the backpacks knowing that we had other resources that were also ready to go if we had the time and means to carry it. We have tried them mixed with just water and they taste fine. It will give an extra boost of calories and provide variety to plain water! Hello. 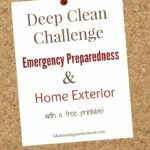 I am someone who just went through Hurricane Florence and was searching for ways to be better prepared. I have a question about the food that needs to be prepared. We didn’t have electricity for three weeks so I am curious as to how you would cook the food. We had food but all was basically food that didn’t truly have on be cooked. Open can and eat more or less. It was our only option. Any suggestions I would appreciate. Thank you. 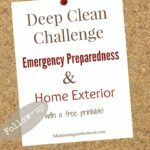 Your post is by far one of the most comprehensive, easy to read articles on 72 hour prep that I’ve seen. My family and I are in the research process and will preparing our kits within the next couple of weeks. Again. Thank you! Thank you so much! I’m glad it was so helpful! I can seem to print off the lists? I just checked all the printables and they seemed to work just fine on my end. Try again and if it still doesn’t work, I can email them to you if you would like! I purchased some Hydroheat Flameless Cookware from Emergency Essentials (beprepared.com). You can buy the round containers to cook a meal or the tumbler to heat up water for coffee. They come with a heat pack and when you add water it causes a chemical reaction that heats up the water. 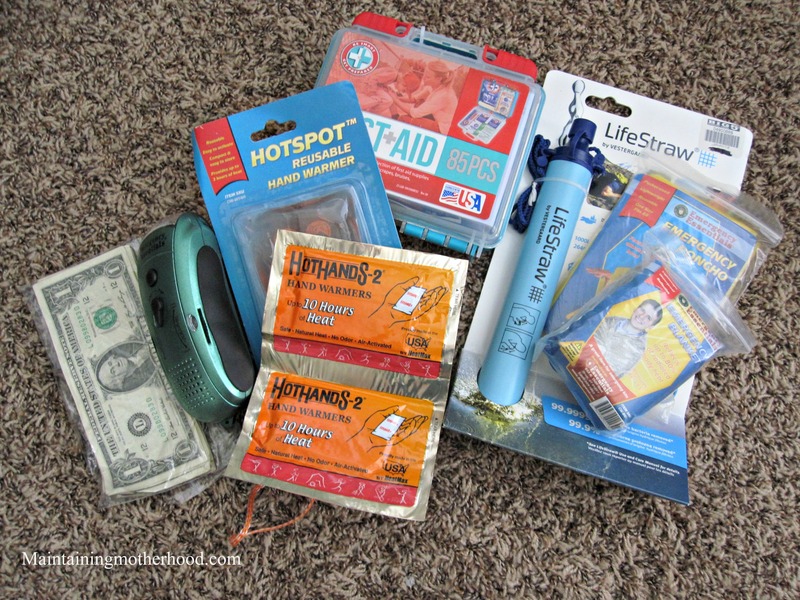 I’m sure you can buy them other places but often Emergency Essentials has them on sale. Normally around $30, several times they’ve had them on sale for around $10. They’re small enough to travel with and perfect for quick-cook food or heating up food when you don’t want to drag out a stove and fuel.